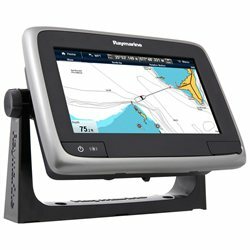 Raymarine a75 7 MFD Touchscre..
a75 7 MFD Touchscreen - Navionics North America Gold 3,000 Lakes & RiversRaymarine's a75 Multifunction Touch Display is a full-featured multifunction display with a built-in GPS receiver and Navionics compatible chartplotter. Select a75 models include Navionics Silver or Gold charts on microSD, or you can upgrade to 3D charting with satellite photos with Navionics Platinum Plus charts. The a75 can be expanded to include radar, sonar, CHIRP DownVisionT, weather, AIS, and much, much more.